I am not required to do the shopping because Spanish and managing transportation is necessary. However, this means I have to make do with what I am given. So sometimes the loaves of bread, though each nourishing in their own way, can present a challenge for a perfect sandwich. I run out of whole wheat in the middle of a spreading and have to have a bi-color group. Or the square slices have to mesh with the rectangular loaf and jelly hangs out of the edges. At 11:30AM, none of these differences matter. 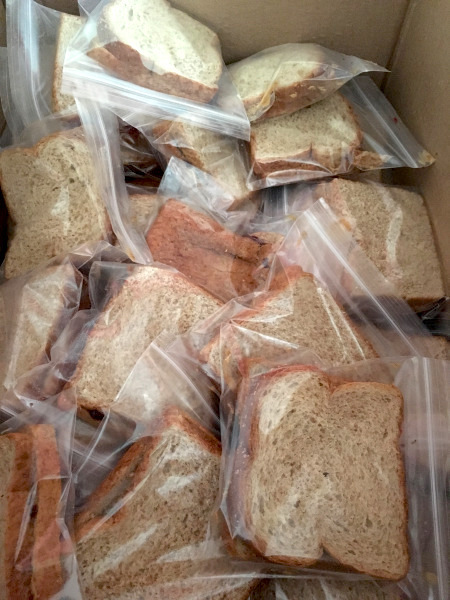 All are in sandwich bags where they belong, and people are happily fed and no one gets sick. So God looks at us in Collique: “People are not all alike.” This one has medical knowledge while the other one twists bandages. Spanish is necessary, but mothers hand over children to the nurse who smiles and holds out her hands. Dentists don’t do eyes, and the vision group doesn’t use drills. Music, colors, games, and lots of bouncing keep children's workers busy. At 5:00PM, each boards the bus, having fulfilled their purpose: sick healed, sight restored, and children taught how to find the Kingdom. Charis Smith has been lunch lady for 11 years. She and her husband David are longtime members of South Main, where Charis teaches 1st grade Sunday School.